There are 2 ways to convert your HTML theme into Pulse Template. 1. Replace existing template with the new template. 2. Leave the existing temaplte and create a new one. Note: I would suggest to follow the second one. In this way, your files will never be replaced whenever you update Pulse. And you will be able to use the default theme whenever you want. Go to Pulse installation directory and open the folder 'template'. Create a new folder (example: some-name) for the new theme and put your template files there. This code will render meta informations like content/keywords. Put those codes before the header closing tag. Replace <body> with the following code. This will render body classes. After the opening body tag, add the following code. And this will show the admin menu on the site when you are logged in. Before the end of the body tag put the following code. Now, whereever you have external files (ex: css/js/img) called, you have to set the correct path to make them working properly. For example, if you have a css file named style.css in '/template/your-template/css/' you need to set it's correct path like the code bellow. To pull the content from the admin panel add the following code in between the body tags. Make sure to add the classes inner and group in the wrapping element. They will enable front-end block editing of the content. 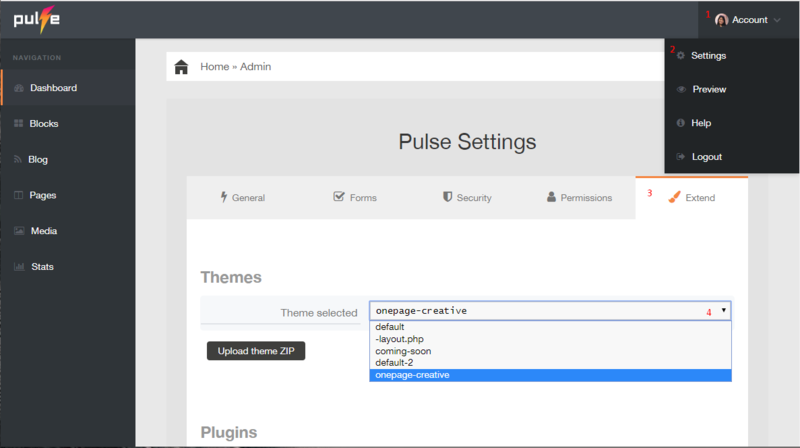 Now activate your new template form the Pulse admin panel. From top-right user menu, select settings. Select last tab named "Extend"
Select your theme from the dropdown menu. Hit "Save" in the bottom. How to add block in layout.php? How to add Pulse dynamic menu? How to add email subscription form? If you face any problem, post on our forum.